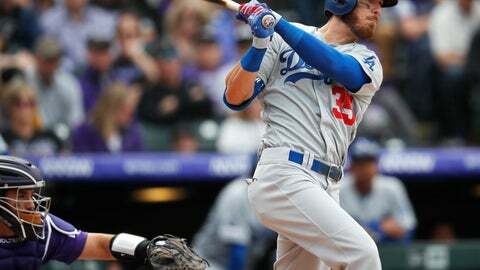 Cody Bellinger and the Los Angeles Dodgers are on a home run rampage, hitting a whopping 21 in their first eight games — that’s the second-most in major league history in that span, only behind the St. Louis Cardinals’ 23 in 2000. After launching a franchise-record 235 homers last year, the NL champion Dodgers have connected in every game so far this season. The defending World Series champion Red Sox are 2-7 on their season-opening 11-game road trip. They got pounded 15-8 Friday night in Arizona — starting pitcher Rick Porcello flung a water cooler against the back wall of the Boston dugout after getting hit hard, and infielder Eduardo Nunez came in to pitch in the eighth inning and gave up a home run to Alex Avila. … Joey Votto and the Reds have been shut out in three straight games. Their scoreless string of 28 innings is the longest for Cincinnati since a 30-game drought in 2015. … The Cubs have lost six straight. … The Marlins have dropped nine games in a row at Atlanta.